The Summer 2010 photo came to us from the scrapbook of the late Beatrice Lynch, who was a long-time and active member of what was then called the Ladies Auxiliary of the Ancient Order of Hibernians. 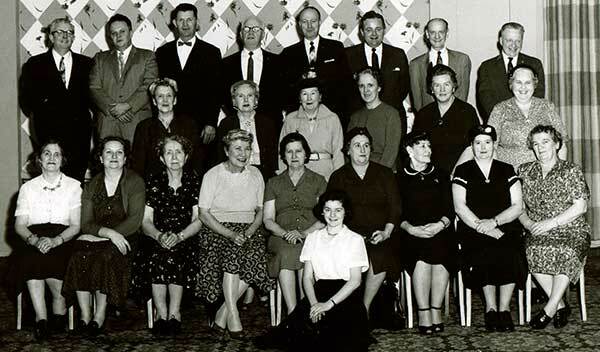 The photo depicts a Hibernian gathering in the late 1950s or early 1960s, prior to 1962. Standing in the third (rear) row, from left to right, are: Bill Berry, James Nolan, James Lynch, Michael O’Brien, Ray Gaffney, George Sebold, and Joe Farrell. Seated in the second (center) row, from left to right are: Mary K. Ryan, ?, ?, Mary O’Leary, Bridgie Corrigan, and Mary Ellen Murphy. Seated in the first (front) row, from left to right, are: Catherine Sebold, Mary McMackin, Rose McMackin, Marie Kelly, Beatrice Lynch, Agnes Kankofl, Elizabeth Damon, Rita Gallagher, and Catherine Tiffe. Kneeling on the ground is: Betty Clark.